Recently released research by NAHB reaffirms that homeownership is an important component of household wealth accumulation. Part of the reason why the primary residence is an important source of household wealth is because of its size on the household balance sheet. 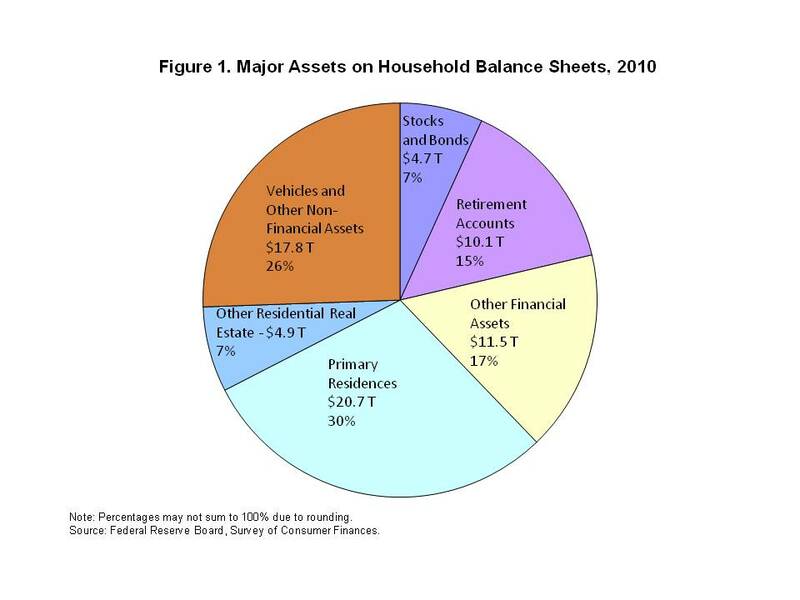 As Figure 1 illustrates, the primary residence represents the largest asset category on the balance sheets of households. At $20.7 trillion, the primary residence accounted for almost one-third, 30%, of all assets held nationally by households in 2010. According to the report, the primary residence represented 62% of the median homeowner’s total assets and 42% of the median home owner’s wealth. 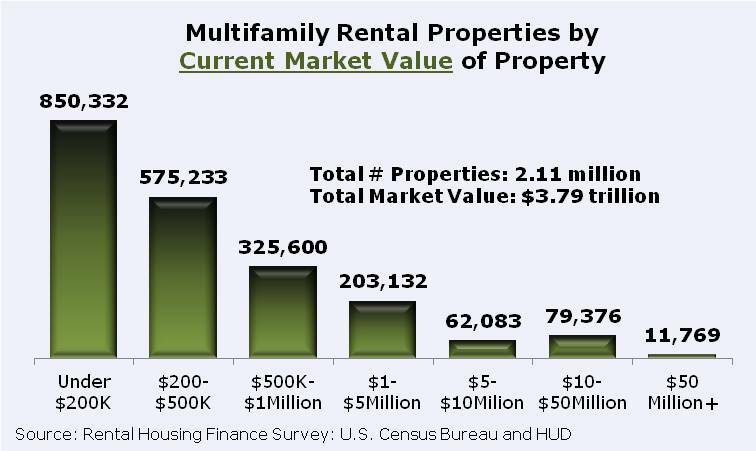 In addition, the median value of the primary residence across all households was $100,000. In contrast, the median values of financial assets and vehicles were only $17,000 and $12,200 respectively. Another reason why the home is a large part of household balance sheets is because it is a widely held asset. The report shows that two out of every three households, 67%, owned a primary residence in 2010 while just over half of households, 50%, held a retirement account. Meanwhile, 16% of households owned either stocks or bonds. The recent bust in the housing market had a severe impact on household balance sheets. Plummeting house prices contributed to the decline in the value of household assets. At the same time, prices of other assets such as equities also dropped, thus leaving the average contribution of the primary residence to a household’s total assets relatively unchanged, as shown in the report. However, since the debt underlying the primary residence did not decline as quickly as house values, the average household experienced a decline in both total wealth and in housing’s contribution to a household’s net worth. Nevertheless, as house prices recover, so too should household wealth. Equity in residential property tends to be a particularly important component of wealth for lower income, older households. According to the report, the median net worth for households over the age of 75 with household income below $35,000 was $110,900 in 2010. This is 25 times the net worth for households under age 45 in the same income bracket have. Also for 75+ households with incomes under $35,000, the median share of net worth held as equity in a primary residence is 60 percent. Younger households in the same income bracket tend to have no equity at all in a home (the median residential equity share of total net worth for households with incomes under $35,000 in which the head was younger than 54 was $0). Higher income households over age 75 have higher net worth and more equity in a home in absolute terms, but equity in a primary residence accounts for a smaller share of total net worth. The Federal Reserve Board recently released its quarterly survey of senior bank loan officers. The standard questions asked by the survey address changes in the standards and terms on, and demand for, bank loans to businesses and households over the past three months. The most recent survey results indicate that a moderate fraction of banks had eased their standards for approving applications for commercial real estate (CRE) loans over the second quarter. About half of the banks, on net, reported that they had experienced stronger demand for such loans. 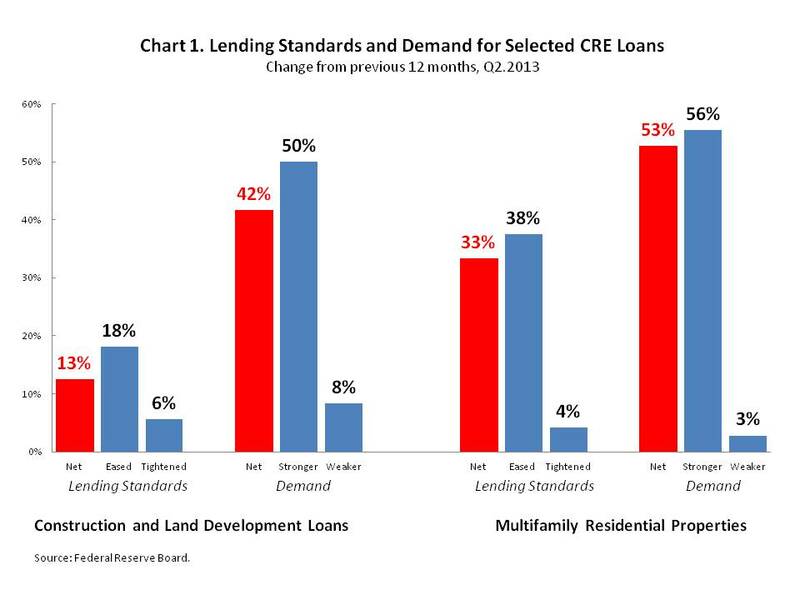 The July 2013 iteration of the Senior Loan Officer Opinion Survey also included a special set of questions on changes in lending standards and demand over the past twelve months for construction and land development loans as well as loans secured by multifamily residential properties, two major categories of CRE loans. According to the survey results, lending standards reportedly eased while demand strengthened. 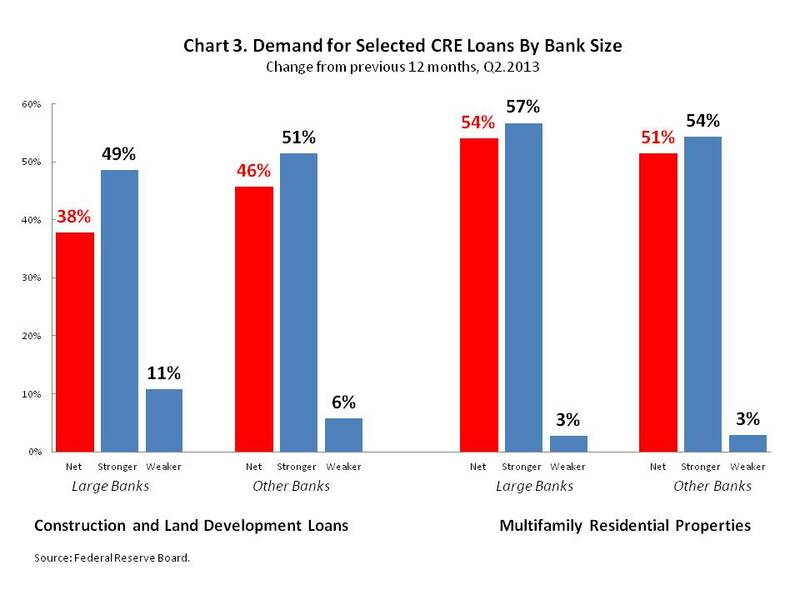 However, for these two types of CRE loans, the net share of banks reporting a strengthening in demand exceeded the reported fraction of banks easing their lending standards. A net fraction of 13% of banks reported their lending standards on construction and land development loans eased over the past year while a net percentage of 33% reported easing lending standards on loans secured by multifamily residential properties. Meanwhile, 42% of banks on net reported stronger demand for construction and land development loans and 53% of banks reported stronger demand for loans secured by multifamily residential properties, on net. Although banks reported easier lending standards overall, the net proportion of banks easing their standards lagged the net share of banks reporting stronger demand. The smaller share of banks reporting easier lending standards over the past year largely reflects a small net percentage of “other banks” easing their lending standards. “Large banks” reported having eased lending standards in greater proportion relative to their “other bank” peers. According to the survey, large banks refer to large, national banks while other banks encompass large but regional banks. 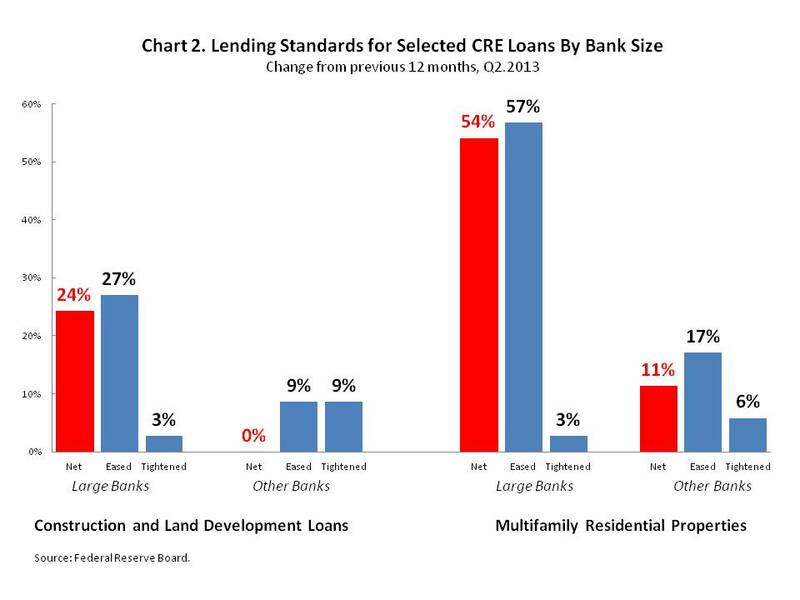 As chart 2 illustrates, a net of 24% of large banks reported having eased credit standards on construction and land development loans over the past year while 54% of large banks eased standards on loans secured by multifamily residential properties, on net. In contrast, a net of 0% of large regional banks reported having eased their lending standards on construction and land development loans while 11% of these banks reported easier lending standards on loans secured by multifamily residential properties. However, strong demand for these loans was reported by banks across geographic concentration. Chart 3 portrays these results. According to this chart, a net fraction of 38% of large national banks reported stronger demand for construction and land development loans over the past year while a net of 54% reported stronger demand for loans secured by multifamily residential properties. Similarly, a net of 46% of large regional banks reported stronger demand for construction and land development loans while 51% of these banks reported stronger demand for loans secured by multifamily residential properties, on net. Overall, a net fraction of banks have reported easier lending standards and stronger demand for both construction and land development loans as well as loans secured by multifamily residential properties. However, eased lending standards are largely occurring at large national banks. Fewer large regional banks on net reported that their lending standards eased over the past year. Meanwhile, all banks, regardless of the size of their geographic concentration reported stronger demand for these loan products. These results confirm similar findings by NAHB’s AD&C Financing Survey. Many homebuilders are more likely to seek financing from regional banks than national ones. As a result, results from the Senior Loan Officer Opinion Survey indicate that CRE lending conditions continue to be a headwind to new home construction. Household debt outstanding rose for the first time in two years. According to data released by the Federal Reserve Bank of New York, household debt grew by $31.0 billion in the fourth quarter of 2012. The quarter-on-quarter not seasonally adjusted growth in household debt reflected an expansion in outstanding mortgages, auto loans, credit cards, and student loans. In the fourth quarter of 2012, these household debt products rose by a combined $41.0 billion. However, these gains were partially offset by a $10.0 billion decline in home equity lines of credit. Since increasing by $41.2 billion in the first quarter of 2011, total household debt outstanding experienced six consecutive quarters of declines, falling by $444.4 billion over that time span. Outstanding balances on home equity lines of credit (HELOCs), which, along with home equity loans, were an important source of bond market growth, expanded significantly between 2003 and 2009. 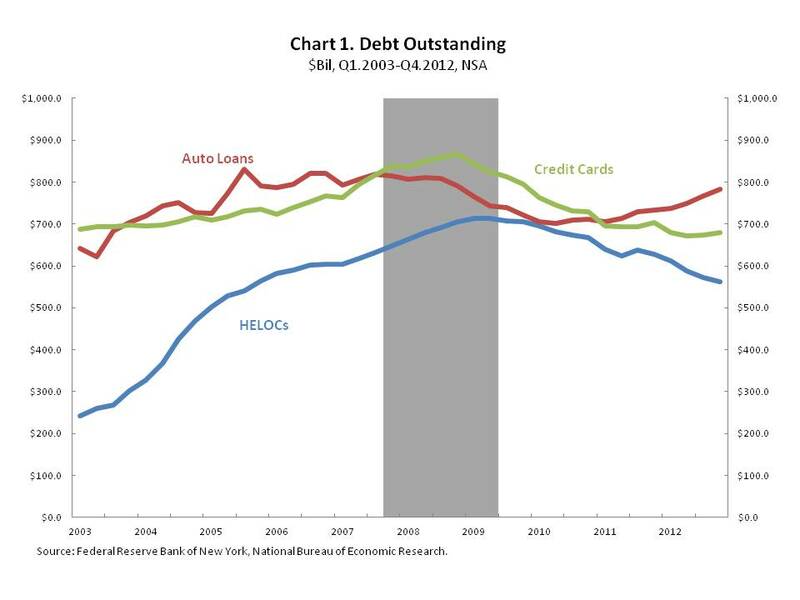 As Chart 1 illustrates, the outstanding amount of HELOCs totaled $242.0 billion in the first quarter of 2003, this amount was 37.8% of the outstanding amount of auto loans and 35.2% of the outstanding credit card debt. However, by the second quarter of 2009, the outstanding amount of HELOCs nearly tripled, growing by 194.6% to $713.0 billion. 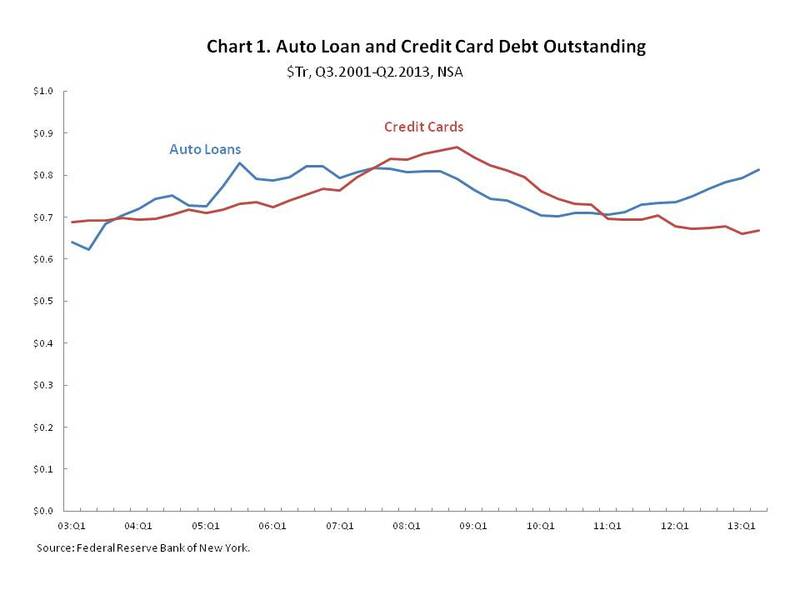 Over this same period, auto loans outstanding, $743.0 billion in the second quarter of 2009, rose by 15.9% while credit card balances, $824.0 billion, grew by 22.5%. Since the second quarter of 2009, the outstanding amount of HELOCs has contracted by 21.0% while credit card debt outstanding has fallen by 17.6%, although it rose in the latest quarter. The amount of outstanding auto loans, which returned to sustained growth in the second quarter of 2011, is now 5.4% above its second quarter 2009 level. The number of HELOC accounts also experienced a period of rapid growth. However, despite the rise in the number of HELOC accounts between first quarter of 2003 and the first quarter of 2008, the number of these accounts remained well below the number of auto loans and the number of credit card accounts. In the first quarter of 2008, there were 24.2 million home equity line of credit accounts, 80.8% greater than the number of accounts in the first quarter of 2003. Over this same period the number of auto loan accounts, 87.2 million in the first quarter of 2008, rose by 18.6% and the number of credit card accounts, 474.6 million in the first quarter of 2008, grew by 1.0%. 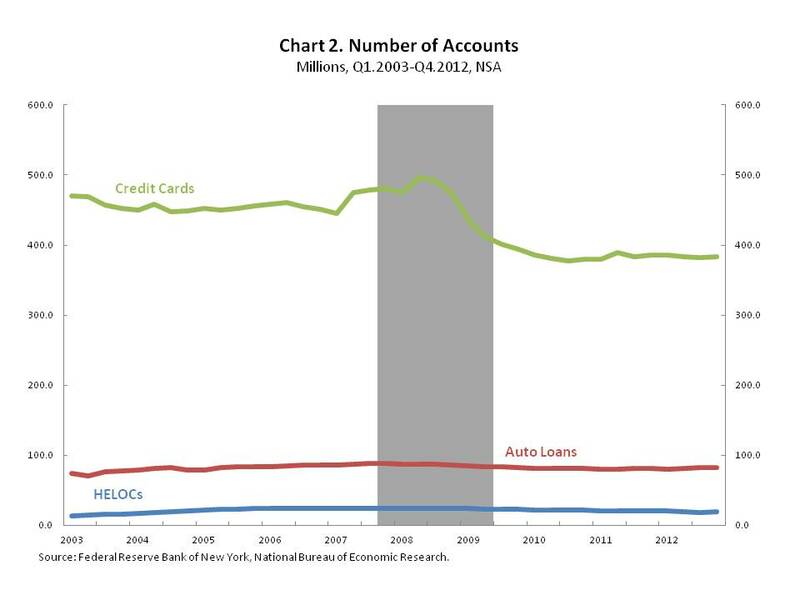 However, at its peak in the first quarter of 2008, the number of HELOC accounts was only 27.8% of the number of auto loan accounts and 5.1% of credit card accounts. The growing amount of outstanding HELOCs was concentrated in a relatively smaller number of accounts. Despite the 80.8% increase in the number of HELOC accounts between the first quarter of 2003 and the first quarter of 2008, the outstanding amount of HELOCs rose by 174.0% over this same period. As a result, growth in the outstanding amount of HELOCs raised the size of the average account balance. 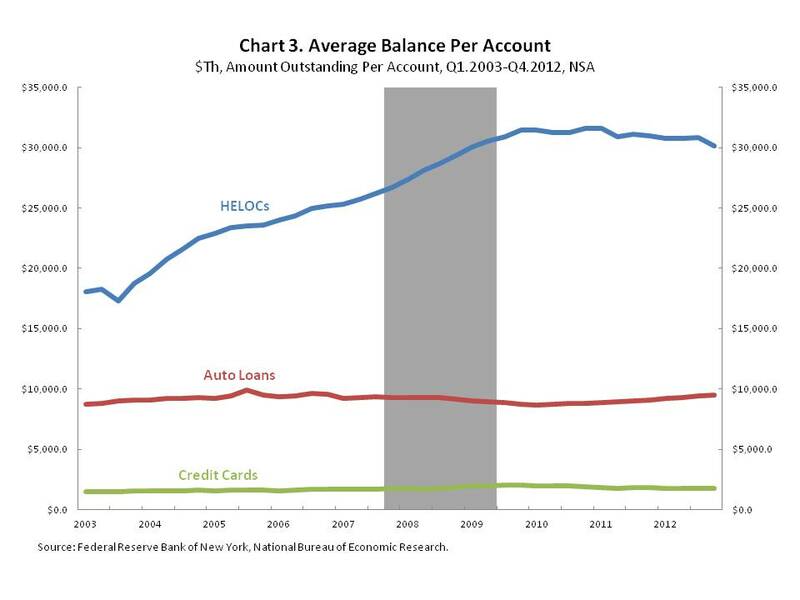 As Chart 3 illustrates, growth in the balance on the average HELOC account, which generally tends to be larger than balances on other consumer financial products, eclipsed account balance growth of both credit cards and auto loans. Between the first quarter of 2003 and the first quarter of 2008, the average account balance on a HELOC account grew by 51.6% to $27,351. Meanwhile, the average auto loan and credit card balance, which grew by 6.3% and 20.4% over this same period, were $9,266 and $1,764 in the first quarter of 2008. In the fourth quarter of 2010, the average balance on a HELOC account peaked at $31,619, 3.6 times the average auto loan account balance and 4.6 times the average credit card account balance. However, since the fourth quarter of 2010, the average balance on a HELOC has declined somewhat, falling by 4.6% over the two year period. 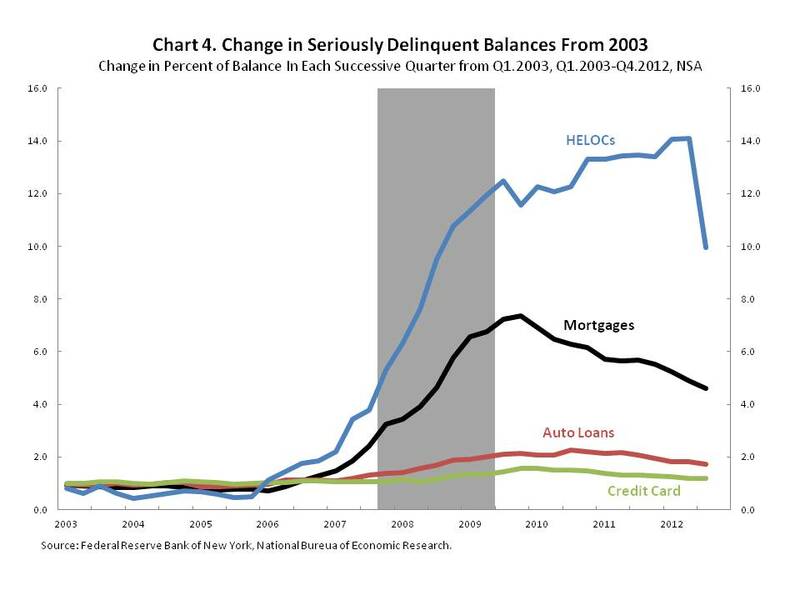 Data from the Federal Reserve Bank of New York that is displayed in the graph shown on page 9 of their report depicts the serious delinquency rate for HELOCs as being the lowest of household debt products. However, the current rate partly reflects that it started from a very low level. Instead, comparing the serious delinquency rate in each quarter relative to its level in the first quarter of 2003 conveys the magnitude of serious delinquencies in HELOCs. As chart 4 illustrates although most household debt products have begun the healing process, HELOCs still languish. In the fourth quarter of 2007, the percent of outstanding HELOCs that were seriously delinquent was 3.8 times its level in the first quarter of 2003. By the second quarter of 2009, the percent of outstanding HELOCs that were seriously delinquent rose to 11.3 times its first quarter 2003 level. Between the first quarter of 2010 and the third quarter of 2012, the percent of outstanding HELOCs that was seriously delinquent rose from 11.6 times its first quarter 2003 level to 14.1 times its first quarter 2003 level. The percent of outstanding HELOCs that are seriously delinquent fell to 9.9 in the fourth quarter of 2012. However, according to the Federal Reserve Bank of New York, the decline in the delinquency rate that occurred in the fourth quarter of 2012 “can be attributed in large part to unusually high charge-offs of delinquent home equity lines of credit”. Meanwhile, in the first quarter of 2010, the percent of outstanding mortgage debt that was seriously delinquent peaked at 7.3 times its first quarter 2003 level, but has since fallen to 4.6 times its first quarter 2003 level. 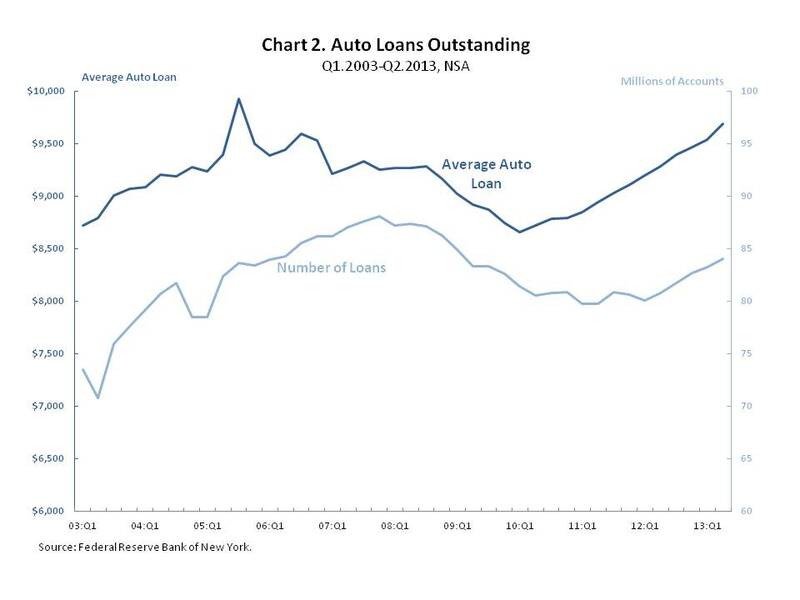 Over this same period, the percent of auto loans that were seriously delinquent declined from 2.2 times its first quarter 2003 level to 1.7 times its first quarter 2003 level and the percent of outstanding credit card debt that was seriously delinquent fell from 1.6 times its first quarter 2003 level to 1.2 times its first quarter 2003 level. Anecdotal evidence collected by the Federal Reserve Board’s Summary of Current Conditions, commonly known as the Beige Book, continues to indicate “moderate” economic growth. In its most recent iteration, 10 of the 12 Federal Reserve Districts reported that economic activity in their Districts had expanded at a “moderate” or “modest” pace since the previous Beige Book. The Boston and Chicago Districts described growth in activity as “slow”. Over the period since the last Beige Book, residential real estate markets strengthened in nearly all Districts. In particular, the Philadelphia District indicated that potential buyers expressed greater confidence, including potential entry-level purchasers that had been increasingly opting to rent up to mid-summer. The Richmond and Atlanta Districts observed multiple offers on many homes. Meanwhile, residential construction was reported as being higher in 11 of the 12 Federal Reserve Districts. Kansas City indicated that residential construction was “unchanged”. Multi-family construction, in particular, exhibited ongoing strength; however some Districts noted that these builders were still facing difficulty securing financing. In the banking sector, borrowing standards have loosened somewhat and asset quality continued to improve in most Districts. Earlier analysis of the Fed’s Senior Loan Officer Opinion Survey illustrated the growing optimism of bankers over mortgage quality in 2013. However, some District banks noted that their measures of profit from mortgage lending were declining. Mortgage applications eased for the second consecutive week. According to the Mortgage Bankers Association, mortgage application activity, which includes both refinancing and home purchase demand, was 1.7% lower on a seasonally adjusted basis in the week ending Feb. 15. In the week ending February 8, the market index fell by 6.4%. The most recent decline in weekly seasonally adjusted mortgage applications reflected both a 1.7% drop in refinancing applications and a 1.7% decrease in mortgage applications for purchase. Applications for a refinancing account for the majority of growth in mortgage applications. The impact of refinancing applications partly reflects its share of total mortgage applications. Refinancing applications currently account for 72.5% of all applications. 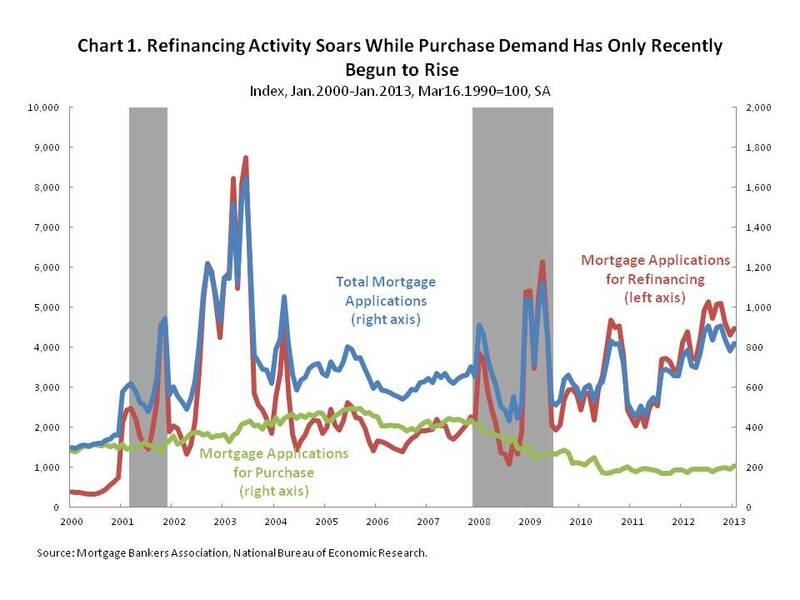 In addition, applications for mortgage refinancing have grown faster than applications for mortgage purchase. As Chart 1 illustrates, mortgage applications for refinancing have risen steadily since early 2011. Meanwhile, mortgage applications for purchase have remained relatively flat through 2011 and most of 2012, rising noticeably only in the last few months. Between March 2011 and October 2012, total mortgage applications grew by 78.2%. During this same period, mortgage applications for refinancing more than doubled, rising by 115.4% while mortgage applications for purchase grew by only 1.1%. Since October 2012, total mortgage applications have declined somewhat as the drop in applications for refinancing more than offset the increase in the mortgage applications for purchase. Over the past four months, total mortgage applications have decreased by 9.6% as mortgage applications for purchase rose by 6.7%, but mortgage applications for refinancing declined by 12.6%. The Federal Home Loan Mortgage Corporation compiles statistics on loans it purchases that refinance loans already held in its portfolio. These statistics are based on a sample of properties for which it has funded two or more successive loans. In 2012, 53.8% of these refinancings resulted in a new loan amount that was unchanged from the previous loan, an increase of 7.2 percentage points from 2011 and 8.6 percentage points from its 2003 peak. Meanwhile, the share of refinancings that led to either a higher loan amount or a lower loan amount both declined between 2011 and 2012, by 2.5 and 4.7 percentage points respectively. Conversely, between 2003 and 2006, the vast majority of these refinancings resulted in a higher loan balance for the homeowner. In 2003, 38.5% of refinancings resulted in a new loan balance that was at least 5.0% greater than the pre-refinanced loan balance, while 16.3% of refinancings led to a lower loan balance and 45.2% of refinancings had no effect on the loan balance. 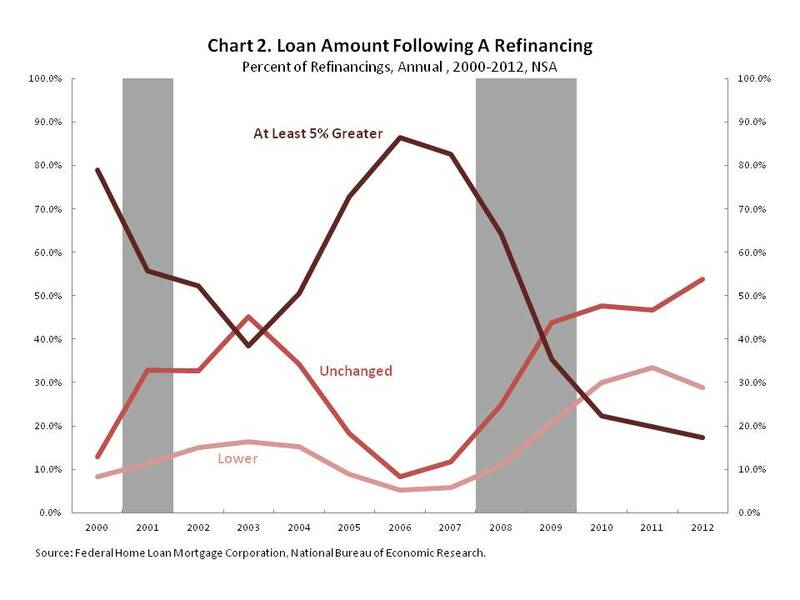 By 2006, the share of refinancings resulting in at least a 5.0% higher loan balance grew to 86.3% while the share of refinancing that resulted in a lower loan balance stood at 5.3% and the share refinancing that left the loan balance unchanged was 8.4%. 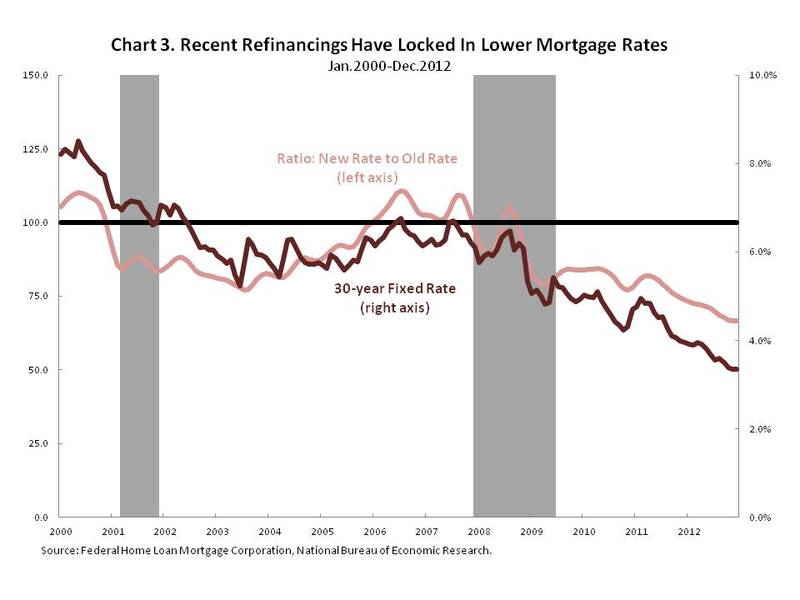 However, between 2006 and 2011, growth in both the share of refinancings resulting in a lower loan balance and in the proportion of refinancings that leave the loan amount virtually unchanged have offset the decline in the percentage of refinancings that led to a higher loan amount. In addition to its data on loan amounts, the Federal Home Loan Mortgage Corporation also maintains statistics on the ratio of the new to old mortgage rate and reports the median ratio. In this ratio, the numerator is the mortgage interest rate on the newly refinanced loan amount and the denominator is the rate on the old mortgage. The data exclude adjustable rate mortgages. A ratio equal to 100.0 indicates that the average refinancing did not change the mortgage interest rate while a ratio below 100.0 means that a refinancing resulted in a lower mortgage rate on average. A ratio greater than 100.0 indicates that refinancing led to a higher average interest rate. As mortgage rates rose between January 2003 and December 2005, the difference between the mortgage interest rate on the old mortgage and the interest rate secured after refinancing began to shrink. By January 2006, refinancing resulted in a higher interest rate, on average. As Chart 3 illustrates, between January 2003 and December 2005, the 30-year fixed rate mortgage rose by 0.4 percentage points to 6.3%. Meanwhile, the ratio of the new rate to the old rate rose by 18.5 points to 99.7. In January 2006, the ratio reached 100.7. The ratio of the new rate to the old rate remained above 100.0 until November 2007 and it eclipsed 100.0 again during the third quarter of 2008. More recently, refinancing has allowed some existing homeowners to lock-in a lower interest rate and lower their monthly mortgage payment. As Chart 3 shows, the recent decline in the 30-year fixed mortgage rate coincides with a decrease in the median ratio of the new mortgage interest rate and the old mortgage rate. Between April 2011 and December 2012, the 30-year fixed mortgage rate fell by 1.5 percentage points to 3.4%. At the same time the ratio of the new rate to the old rate declined by 15.4 points to 66.5. In other words, the new mortgage rate obtained from a refinancing was, on average, 66.5%, of the old mortgage rate. According to research by NAHB, a new interest rate that was both 3.4% and was also 66.5% of the old mortgage interest rate, 5.0%, would result in an estimated mortgage payment savings of roughly $182 per month or $2,184 per year on a $225,000 mortgage loan. Over the span of 30 years, an existing homeowner would save an estimated $65,520 under these conditions.